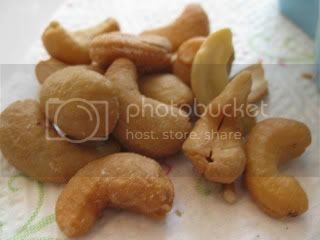 Before heading out to go shopping this morning, Lowe’s for him and Kohl’s/NY&Co for me, I had a quick snack ~ 1 cup of cherries & 2 Tbsp of cashews. I never knew shopping for “solid” colors would be such a challenge and that practically everything I own has patterns. I had to find something “family casual” that was a solid color. I did score a shirt with a matching necklace and earrings for tomorrow. I will try to remember to take a pick to show it off. After shopping for what to wear on The View From The Bay tomorrow, we stopped at Red Robyn. The Jump Start Menu called for a chipolte chicken breast with a cheese quesadilla with salsa. I made sure to work this into my order. Did you all know that Red Robin has the coolest nutritional calculator online? You can customize it for what you order (like if you omit mayo or cheese or what not) – I LOVE this feature. You can click HERE to check it out. 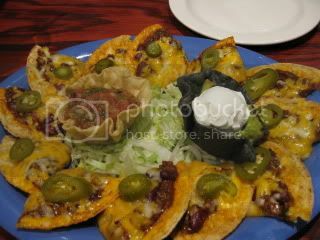 We started off with a not so healthy, but SOOOO GOOD appetizer ~ Chili Cheese Nachos! The entire dish is 1,131 calories without the sour cream – how insane is that?! I justified in my brain that 2 chips would count as my quesadilla requirement. 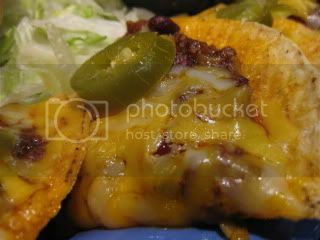 Can I just say they were the best nachoes I’ve ever had? I added a little guacamole and salsa on each chip. 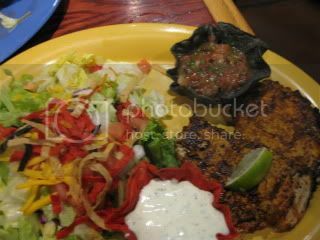 For my entree I ordered the Ensenada Grilled Chicken Platter. It seemed like one of the healthier options and fit in with my grilled chicken. I used salsa on top of my salad that was surprisingly good. In the past I’ve ordered this without the cheese or tortilla strips but forgot about it this time. I didn’t pick them off though….. 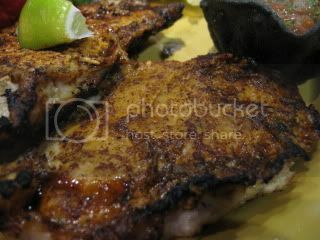 This dish came with two cajun grilled chicken breasts. I was pretty full at this point so I ended up having 1/2 a breast and taking the rest home. All together without using that creamy lime white stuff you see, my modified dish was 537 calories. I am thinking I had alot less than that since I only ate about 1/4 of the chicken. I am thinking that there was alot of fat and such in what we ate for lunch because I did not get hungry the rest of the afternoon. My body works pretty much like clockwork and I eat every 3-4 hours. 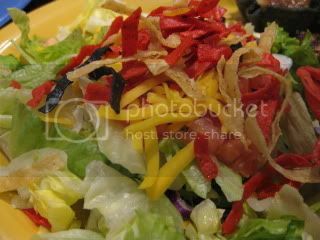 As you all may have noticed, I do not eat fast food and try to avoid it whenever possible. After watching Supersize me and once I started my Weight Watcher journey, I decided it just wasn’t worth it for what you got. In case you needed an added push ~ have you ever wondered what goes into your fast food hamburger? Click HERE to read this article that amazed me to read! Can you believe McDonald’s Big Mac is made up of 67 Ingredients ~ a far cry from their claimed slogan – 2 all beef patties, special sauce, lettuce cheese. I’d love to know what you think of the article. How do you feel about fast food? I have tried to avoid fast food ever since I worked at McDonalds in high school. Sometimes I’m forced to eat there by friends who refuse to go anywhere else for a meal, but I try to avoid that as much as possible. Despite my love of healthy food, the smell of a fast food joint makes me crave the unhealthiest stuff there. And I don’t trust myself with any of that fried stuff without bingeing. By the way those cherries look amazing. 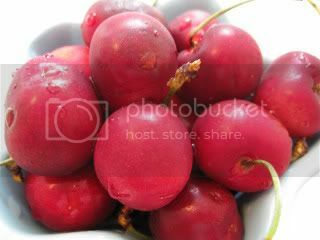 I haven’t had cherries since last summer. I can’t wait until they are in season again! I love fresh cherries so much! I have to admit that I’ve had fun playing with that Red Robin calculator in the past…such a cool feature! Chickpea ~ LOVE the name! I agree – I had so much fun checking out different foods for what I could order next time. All restaraunts should do interactive Nutritional Guides like that.